Conﬁnement feeding (also referred to as lot feeding or feedlotting) is an intensive feeding system in a conﬁned area where all, or the majority of, feed and water is supplied to animals. Conﬁnement feeding is a useful option for sheep producers wanting to feed for maintenance during a drought, defer graze during autumn in a normal year, or feed for production to finish lambs. Incorporating a feedlot into these feeding systems requires consideration of location, equipment and costs. seasonal conditions through summer. Summer rainfall and high temperatures increase the rate of breakdown of dry pasture. Setting up a confinement feedlot or paddock is also beneficial after the break of season to allow deferred grazing, a tactic designed to allow germinated plants to establish a root system and reach a leaf area index that maximises pasture growth rate. The single biggest factor influencing early pasture growth is plant density, so removing grazing animals reduces the risk of uprooting small seedlings. A minimum feed on offer (FOO) of 500 kilograms of dry matter per hectare (kg DM/ha) is recommended before animals are introduced onto the deferred pasture. The advantages and disadvantages of confinement feeding are outlined below. enables close observation of stock in poor condition. effort and expense of possible effluent disposal. ensure minimum recommended distances from water courses and water storage are applied to avoid contamination (see next page). The tables below outline minimum space requirements for different classes of sheep when confined in either a sacrificial paddock or outdoor feedlot. Sheep should be introduced to any new ration slowly - over two weeks (especially high starch diets). Rations can be tailored to sheep requirements depending on the class of stock. The site should be well-drained, protected from prevailing winds and convenient to yards, silos and a water source. A site should be located close enough to base to allow regular checking of animals and minimise travel, but far enough to avoid the potential effects of dust and smell. Select a site that minimises water pollution risks caused by nutrient run-off. The site should be located at least 50 metres (m) from intermittently ﬂowing watercourses and 100m from permanent streams or rivers. Avoid sites upslope from dams so that run-off does not contaminate the dam. A slope of about 3-4% is desirable to aid run-off without causing erosion. Grade banks placed above conﬁned feeding areas on sloping sites will reduce run-off. The longest side of the feeding enclosure should be aligned with the contour. Choose an appropriate soil type such as a hard clay or loamy soil. The most suitable soil types are those that do not become too dusty in summer and do not cause too much mud, run-off or leaching over winter. Trees, sheds or shelters for shade and protection are desirable but not essential. Trees in a conﬁned area need to be protected from ringbarking. Smaller groups are easier to manage in a feedlot than one large mob. Mob size should be no more than 500 sheep, and farmer experience suggests smaller mobs of 200 are better for young sheep. 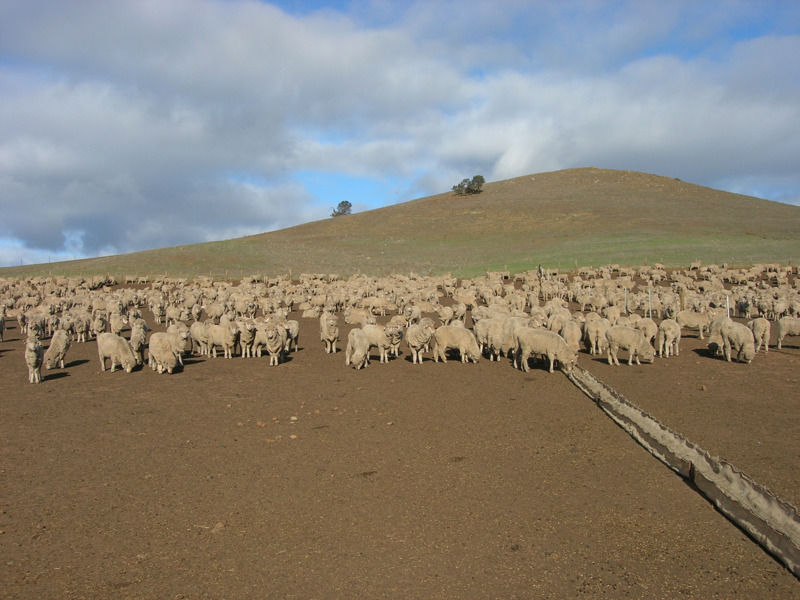 For example, if an allowance of 5 square metres (m2) per head is made for a mob of 500 dry ewes, then the conﬁnement system would need to be 2500m2 (for example, 50m x 50m or 25m x 100m). The mob size needs to be adjusted according to the class of sheep run in conﬁnement. Having more than one pen allows for sheep to be separated according to class or age and allows for pens to be spelled. Feeding into troughs prevents feed wastage and reduces the risk of animal health problems (salmonellosis and coccidiosis). Troughs need not be pretty nor expensive - just functional. Troughs can be designed so sheep have access to one side or both sides and it is important that the correct feed space allowance is provided to reduce shy feeding. If double-sided access to trough, allow 15 centimetres (cm) per lamb or 20cm per adult of trough length. If animals have access to only one side of a trough, the trough length will need to be doubled. Troughs are best raised off the ground to reduce fouling. However, this may not be practical where a feed trailer has to straddle the trough. Lift the top edge up to 40–45cm for weaners and 50–55cm for adults. Examples of materials used to construct a trough may include conveyor belt matting, galvanised iron, shade cloth, tarpaulin and commercial channeling. Self-feeders are a useful labour saving apparatus in feedlot systems where the objective is to feed for production. Self-feeders supply maximum feed intake to get sheep to a marketable weight, so are more suited to the ﬁnishing of stock as opposed to ration feeding such as during a drought or when maintaining stock. Less trough space is required for self-feeders. Allow 4-5cm per lamb and 5-10cm per adult (use the upper end of this allowance for sheep with wool longer than 2cm). Sheep tend to arrange themselves better around circular self-feeders than rectangular self-feeders. Lick-feeders can also be used in finishing systems but are more suited for providing supplementary rates of feed to stock for maintenance during drought or when pasture is limiting. They are also useful in stubbles. The ‘lick’ principle requires sheep to actively lick grain from restricted areas within a feed trough until ‘tongue-tired’. Intake can be regulated to a few hundred grams of supplement daily, but intake rates can be variable. As with self-feeders, lick-feeders save on labour, wastage of feed, and reduce the proportion of shy feeders. There can be issues with blockages due to ‘fines’, and acidosis can still occur — lick-feeders are not a substitute for safe grain introduction. A general rule: if 40% or more animals are ‘cud chewing’ at any one time, fibre level is adequate. An inspection of manure will indicate if roughage is adequate; pebbled poo indicates roughage is fine. Weetbix poo suggests acidosis may be an issue, and mucus-covered runny poo is an indication that acidosis is occurring and roughage intake is too low. If hay is not chopped and mixed in with grain, a large amount of wastage can occur. Consider surrounding the large bales in weldmesh or panelling (such as portable sheep yards) so that wastage is reduced but animals can still access the roughage source. Hayracks can be used for large square bales. It is also important to prevent sheep from climbing on top of hay bales or rolls, as it is possible for bales to collapse and sheep to be suffocated or crushed. This applies particularly to lambs. A guaranteed supply of good quality water is essential in a conﬁnement feeding system. The amount of water consumed by sheep depends on the weather, type of feed, quality of water and their physiological stage (for example pregnant, lactating). Allow for 4-6 litres per sheep per day. Dams should be fenced out of the conﬁnement area and stock watered using troughs. Troughs need to be cleaned regularly as contamination with faeces, dust and feed will reduce water intake. Place water troughs at the opposite end to hay and feed sources to reduce fouling. A minimum trough length of 30cm plus 1.5cm per sheep (with one-sided trough access) is recommended for mobs of up to 500. For example, a trough length of 7.8m is the minimum requirement for a mob of 500 sheep. It is essential that pipe diameter and water pressure are adequate to ensure water can be supplied to troughs at all times.